We were supposed to visit Botswana over a weekend. Our Mafikeng family organised a surprise trip to Sun City so we postponed the trip. 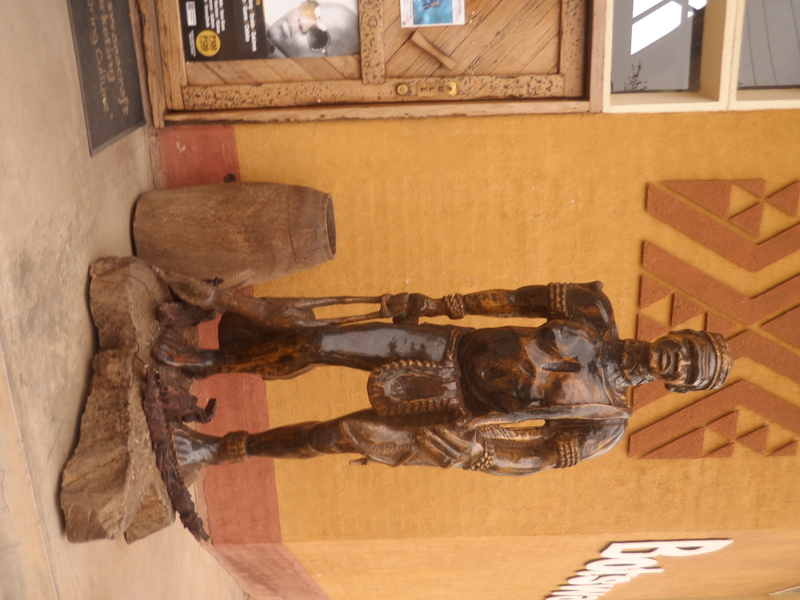 It became a one day trip which is so sad because there is so much to see and do in Botswana. 5am – Woke up to prepare for the trip. By the way, in Port Elizabeth and Mafikeng, the sun was up and shining by 5am! 6am – Had breakfast lovingly prepared by Miss D. Miss D can cook, waaaaa! That cooking deserves another blog post just for salivating purposes. 7am – Seated in the taxi (their version of a matatu) awaiting for more passengers to join us for the trip to Gaborone. There is one gentleman already in the taxi. 8am – Two ladies join us. One has enough luggage to fill a row of seats. So we are now waiting for three more people to join us. 10am – We make the decision to pay for the extra seats so that we can leave. 1pm – An eclipse (that we slept through), a zillion and three cows on the road later, we arrive at Gaborone (pronounced Habaroni). Botswana has really good roads. Well labelled, tarmacked with enough room on the side for overtaking ease and other requirements. Despite the great roads, the number of cows on the roads is just unbelievable. I think the worst part is that most drivers cruise on the roads at over 120kph and have to slow down suddenly because a cow has just decided to cross the road. 1.10pm – We meet with our friend who was supposed to host us in Gaborone. She takes us to her lovely home to cool down – yeah, another thing. It is HOT there. Very hot. Not hot like Mombasa or Kampala where there is some humidity. Not like Garissa where there is a breeze. No. Just hot. Like an oven. Where you can’t even sweat. You just evaporate. Not the sweat. You. 1.30pm – We leave our friends house and go visit her kid’s school and we meet her beautiful and charming daughters. We also find out that as much as our pal had assured us that she had booked a bus for the return journey, she had booked a bus to Jo’burg and not to Mafikeng. So we have to be in a taxi by 4pm. 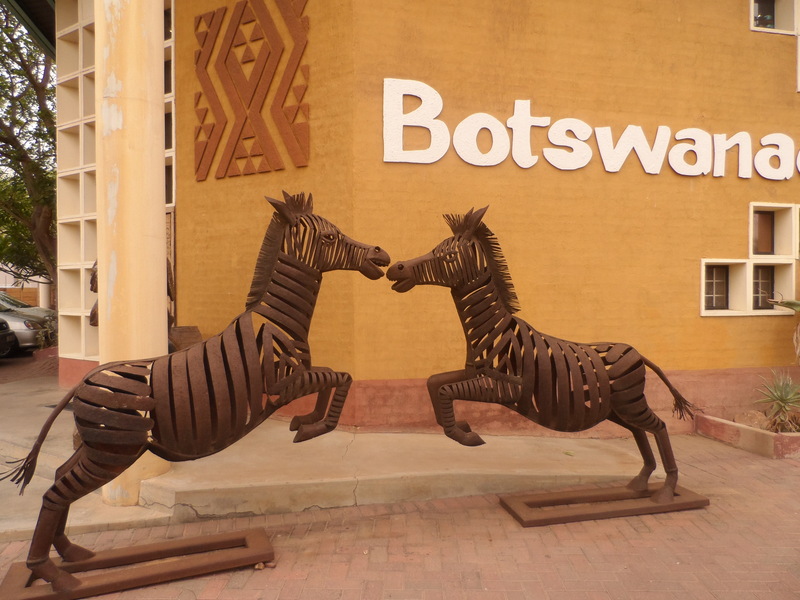 2pm – We take a quick tour of Gaborone. We see the central bank, parliament buildings, government offices, museum, etc very quickly. Without even leaving the car. That was a quick tour. We also got to see the Speaker of the National Assembly. Our president was in Botswana on that day and we were supposed to go for the lunch that he was hosting. Seeing as we got there late, we decided to do our own thing. 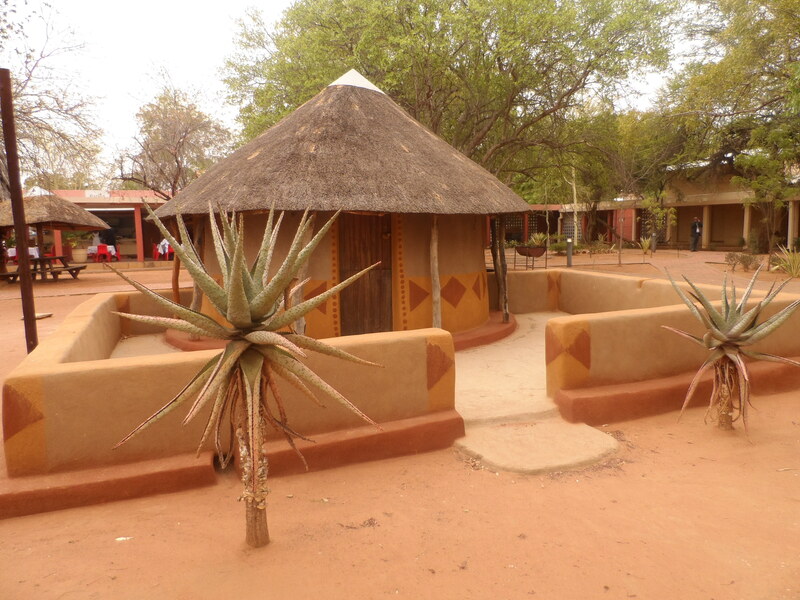 2.30pm – Visited a restaurant (Courtyard Restaurant) that served Tswana food. And I must say, that was the best food I have eaten in a long time. I enjoyed it soooo much, you have no idea. I have goosebumps on my tongue just thinking about it. I had Seswaa (pounded meat which is prepared by men during all special occasions), Bogobe (sorghum ugali) and traditional dried vegetables. MMMmmmmmmm!!! By the way, it was so hot, the restaurant has this overhead gadget that sprays cold water over the patrons – well appreciated relief! 3:45pm – Realise that we need to head back to the taxi rank (matatu stage for the Kenyan in me) and get a taxi to Mafikeng. 4.10pm – Get to the taxi rank and walk to where the taxis to Mafikeng are. We ask the dude next to the taxi at the front to direct us to the one that is going to Mafikeng and he responds, “Mafikeng? The next taxi to Mafikeng will leave tomorrow” Mrs. Adrian starts speaking in tongues. 🙂 I start laughing, Hipilicious asks questions and Skinny takes our luggage and goes to sit down. 4.30pm – The taxi driver who brought us to Gaborone tells us that there are no more vehicles going back to Mafikeng. Mrs. Adrian asks him to get us a cab to drive us at least to the border and we would figure out how to get to the other side. He goes to search for someone to take us and I just know that we are going to pay an arm and a leg for the service. In a taxi, it costs 70 rands per person from Mafikeng to Gaborone (this hasn’t changed since 2006) so in a cab, I thought it would be like about 1000 rands in total for us to be transported to the border. The driver comes back and says that his friend has agreed to take us. But he will only take us to the Botswana border because he doesn’t have a passport and can’t take us to the South Africa border. 5:00pm – We start our journey to the border. It took us 2 hours from the border to Gaborone, we need divine help. I inform our Mafikeng family that we have drama and that we would need them to come pick us up from the border. Our driver is out of this world. Those who know me know that I hate speed. This guy drove so fast. We were mostly at 140kph (on that road full of cows on their way home) and he had the audacity to read and respond to texts! Njenva: So you are allowed to use the phone while driving in Botswana? In Botswana, if you are caught by a police, they will not accept a bribe. They aren’t nice at all. And you are still using your phone while driving? Which is even worse! So if I was undercover police I should be planning to arrest you, right…? 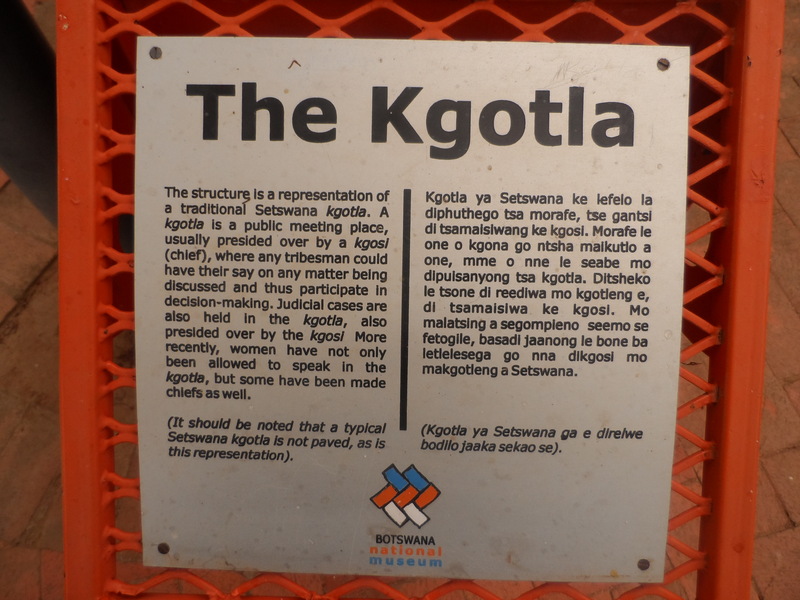 6:35pm – Arrival at Botswana border. Thank goodness we had paid for the cab in advance, otherwise, we wouldn’t have paid him at the speed with which we left his car. We were actually charged 80 rands each. Kenyan taxi and matatu drivers take note. 1. We are black – this is Southern Africa. 2. We are at a border without a vehicle!? Who are we!? 3. We only want a ride to the next border? Only! 4. We have luggage. How now!! So Skinny and I run for a while then we jog then we stop and start taking photos. Then it starts drizzling. So we all hurry up to the SA side of the border. When we get there, we see our Mafikeng mum and dad waiting for us and we almost melt in tears of joy. It was so exciting to see them. I wished we could now meet with all the truck drivers who thought we were vagrants and throw candy in their faces. Well, not really, but it was such a relief. 8:00pm – We finally arrive at Mafikeng and we find that Miss Di has made this amazing lasagna for dinner. This was a day for good food! The food!! 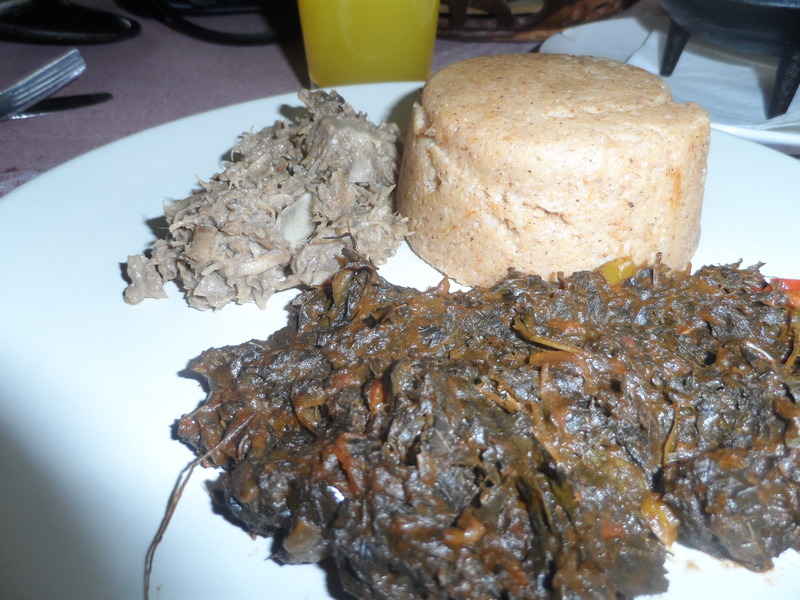 On the foreground is the dried vegetables, in the middle is the sorghum ugali and in the background is a tiny portion of the pounded meat (The serving of this meat was HUGE!). NYUUUUM!!!! 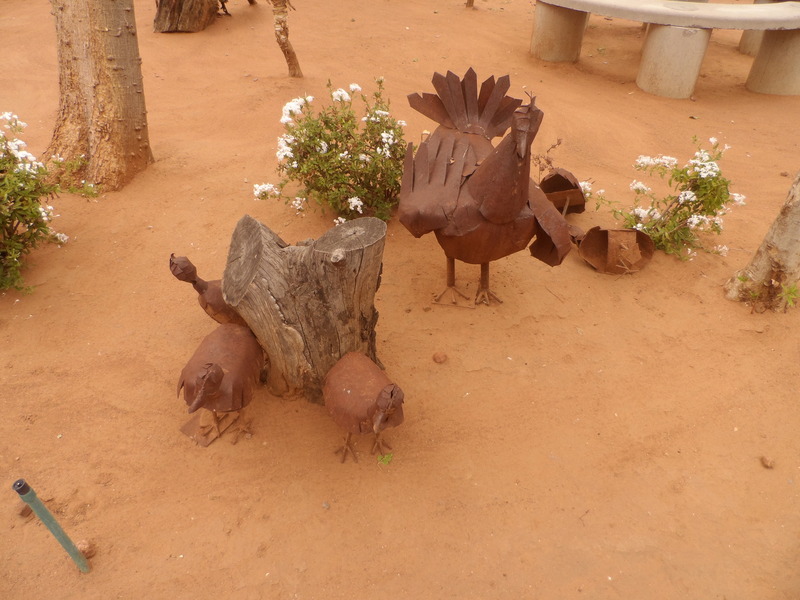 Sculpture of two zebras playing …..
A Kgotla at the museum…….